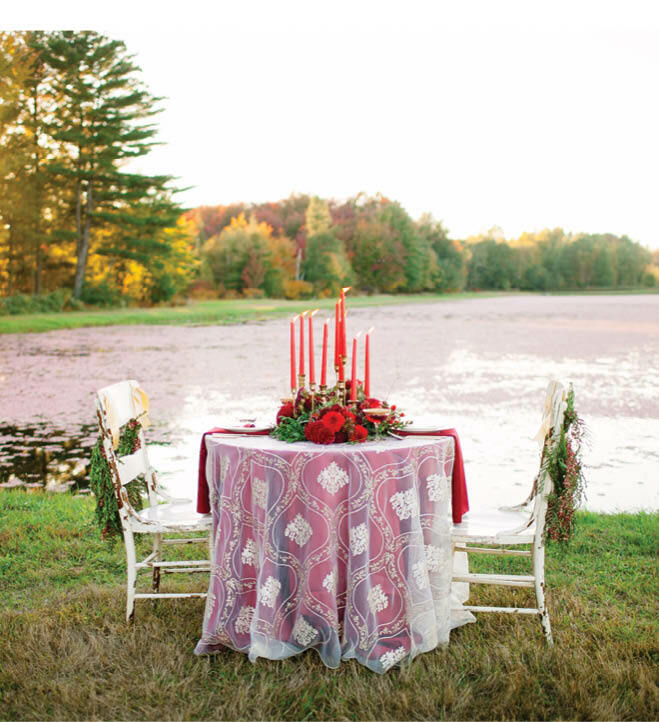 (above) Boasting over 330 acres of working cranberry marshes, Glacial Lake Cranberries, located in Wisconsin Rapids, makes an ideal backdrop for this sweet dinner setting for two—especially when coupled with the glorious fall foliage. The Badger State produces more than 60 percent of the country’s cranberries, after all, so celebrate the little red berry with passion. (above) Maroon, crimson, burgundy and beyond: Call upon cranberries’ shades of scarlet for a chic color scheme. 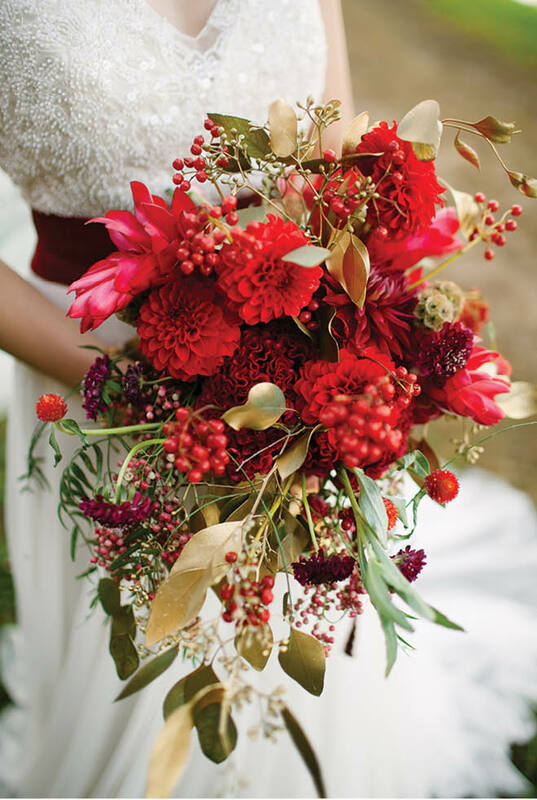 To add a charming twist to a traditional bouquet, balance the blooms with small bursts of the berries themselves. (above) No need for fanciful frills with this petite single-layer cake. 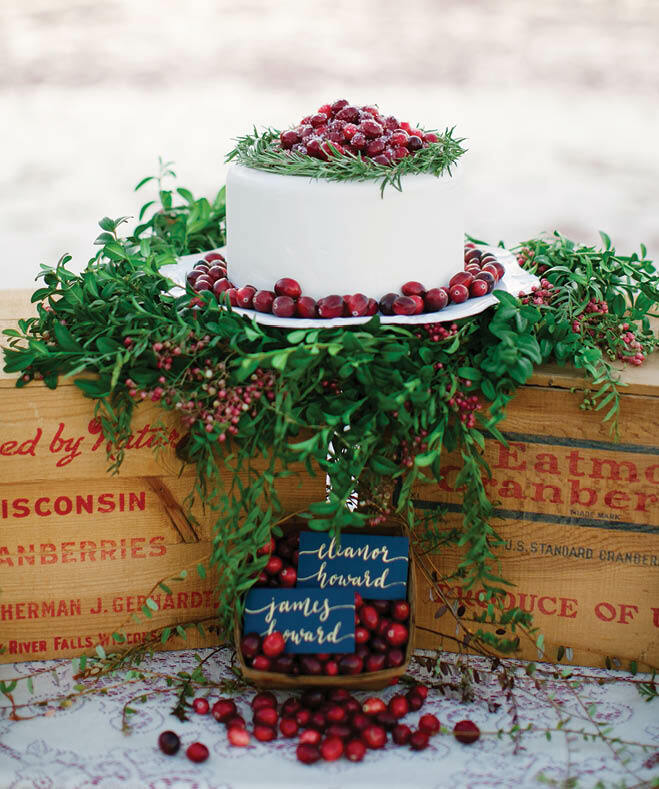 A couple cranberry crates, some greenery and a handful of berries combine beautifully for an easy, elegant display. (above) Among all the hustle and bustle of your big day, be sure to sneak away for a private moment with your new Mr. (and steal a kiss or two while you’re at it). 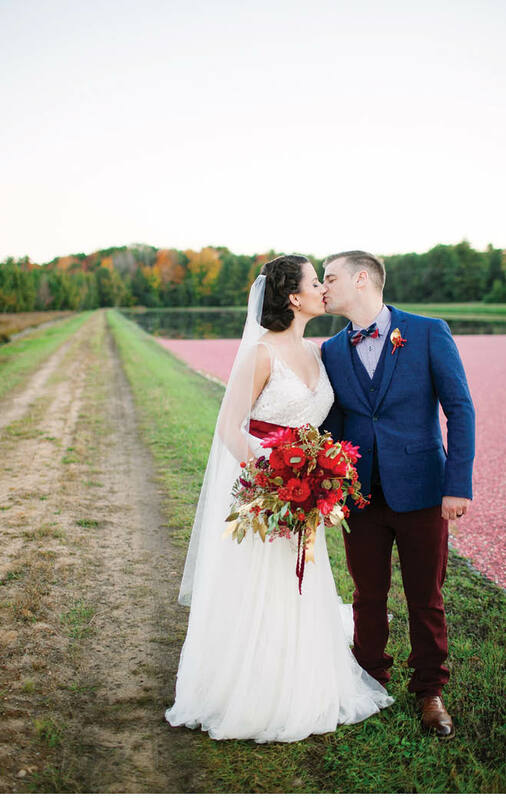 Invite him to partake in the theme with cranberry-colored accents, such as a bow tie or boutonniere. (above) Sit in style with these wonderfully worn chairs from On Solid Ground Vintage Rentals. 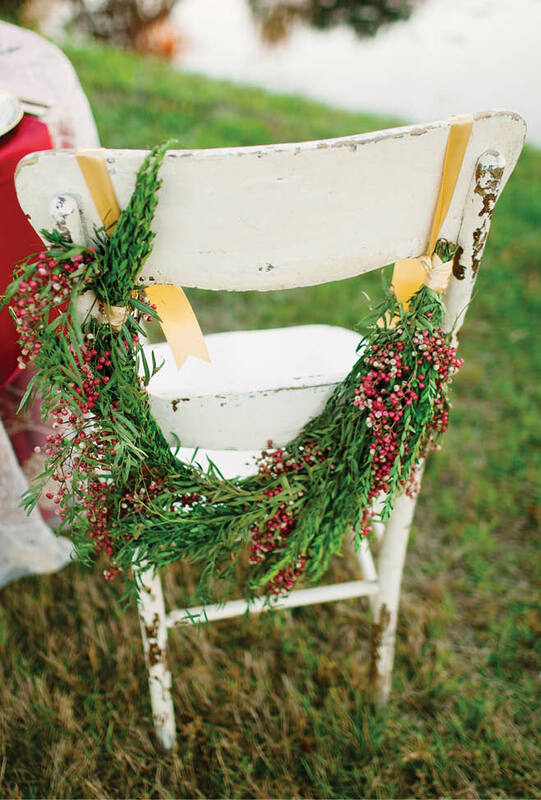 A loosely wrapped wreath draped on the chair back adds an extra element of ease. (above) Décor doesn’t have to be daunting. 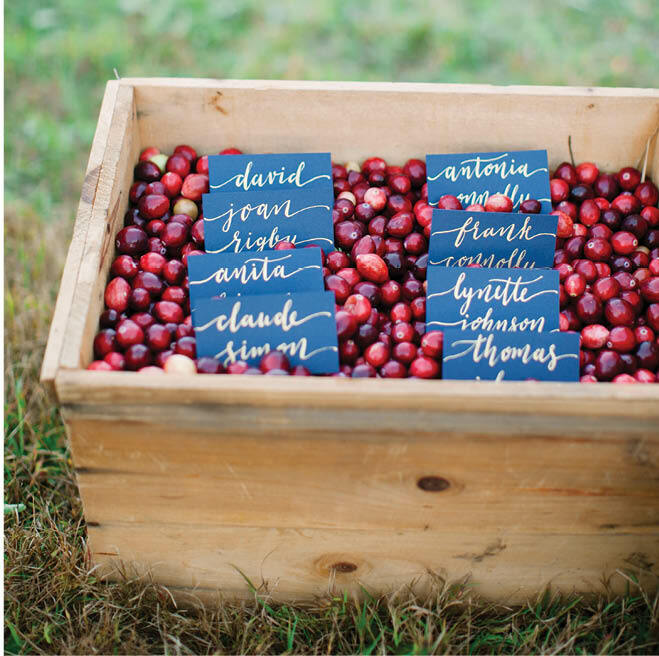 Simply fill a vintage crate to the brim with the berries for a picture-perfect place card display. Delicately hand-calligraphed cards, like these by Hooked Calligraphy, will delight your guests.